Mayonnaise might not be good for your health but it can restore your hair’s moisture. Apply it directly to your hair before shampooing, just like you use your conditioner. Wrap your head in warm towel and leave it on for 15 minutes. Then rinse the mayonnaise and shampoo and condition as normal. Apply mayo to your hair once or twice a week. Avocado and banana are rich in moisture. Mash one ripe banana and an avocado until a thick paste is formed. Apply it to your dry hair and cover with a shower cap. The moisture will be locked inside and intensifies the effect on your hair. After 15 minutes, wash with a mild shampoo. Mix 4 tbsp of olive oil with 2 tbsp of honey. Apply it to your hair and cover it with a plastic shower cap. Leave it on for 30 to 45 minutes then wash with a mild shampoo. Egg and yogurt give protein nourishment to your hair. Egg makes your hair smooth and shiny. Beat one egg white until foamy, then mix it with 6 tablespoons of yogurt. Message this mixture on your scalp and into your hair. Leave on for 15 minutes, then rinse and shampoo as normal. If you have dandruff, try thyme. Boil 8 tbsp of dried thyme in 2 cups of water for about 10 minutes. Strain and cool. Message half of this mixture on your scalp, use the remaining half another day. 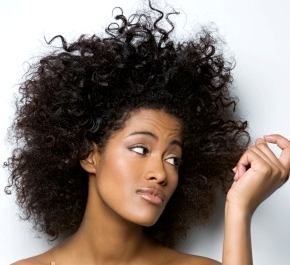 To give your hair shine and remove any buildup from the scalp, use apple cider vinegar. Pour 2 tbsp of apple cider vinegar into 4 cups of water. Use this mixture for final rinse after you shampoo your hair and dry as normal. Another final rinse for great shine is honey. Mix 1 tbsp of honey with 4 cups of warm water. Stir it well until honey is dissolved. Pour this water into your hair, do not wash it out and let it dry.